WASHINGTON A war-weary Congress generally backs President Barack Obama's outreach to Iran, but with tougher U.S. economic measures against Tehran on the way, the president's diplomatic task could get harder if he doesn't make quick progress. Rice: "(We) can't believe the Iranians or trust them"
"They have done everything to make certain that you can't trust them," Rice said. "They hid their nuclear program for decades. They have given the international Atomic Energy Agency the runaround. I negotiated myself with the P5+1, the international negotiating team for them. You absolutely cannot trust them." Obama wants Rouhani to prove that he is willing to curtail some of his country's uranium enrichment activity, which many believe is being used to give Iran nuclear weapons capability. Iran claims its nuclear program is solely for peaceful purposes. Rouhani said Wednesday in Tehran that Iran is open to discussing "details" of its nuclear activities to reach a deal with world powers, but its right to enrich uranium "is not negotiable" but that "we must enter into talks to see what would the other side propose to us about the details." Now, even leading Senate hawks, such as his 2008 opponent, John McCain of Arizona, and Lindsey Graham of South Carolina, have backed Obama's careful engagement effort. They say it is worth testing Iran's seriousness even if they're skeptical about Rouhani's new course of moderation and disdainful of Tehran's human rights record and alleged support for terrorism. While Obama's gesture to Tehran hasn't prompted major GOP criticism, it has fed into domestic arguments over health care and spending levels. Several Republicans in Congress have lambasted the president for appearing "more willing" to talk to Rouhani than with them. In July, the House approved tough new sanctions on Iran's oil sector and other industries. The bill blacklists any business in Iran's mining and construction sectors and commits the United States to the goal of ending all Iranian oil sales worldwide by 2015. The House adopted the legislation by a 400-20 vote. It builds on U.S. penalties that went into effect last year that have cut Iran's petroleum exports in half and left its economy in tatters. China, India and several other Asian nations continue to buy billions of dollars of Iranian oil each month, providing Tehran with much of the money it spends on its weapons and nuclear programs. No bill would likely be finalized before November. That gives the administration at least several weeks to see whether Iran under Rouhani changes course. During the current shutdown, "people are continuing to move the process along and so when the government is back open for business I would expect the bill to come out of the Senate Banking Committee and get to the next stage of the legislative process," said Mark Dubowitz, executive director of the Foundation for Defense of Democracies, a Washington-based think tank that advocates for a tough line on Iran. Meanwhile, Republican Rep. Ed Royce, R-Calif., the House Foreign Affairs Committee chairman, credited America's "damaging sanctions" for getting Rouhani on the phone and said the U.S. must increase economic pressure "until Iran stops its nuclear drive." Some Iran experts, such as Trita Parsi, president of the National Iranian American Council in Washington, believe that any new sanctions imposed at this time will destroy the prospects of diplomacy. Dubowitz believes, however, that the Obama administration would be OK with Congress passing new sanctions as long as it's not too soon. "If the sanctions are on the president's desk by tomorrow morning, I think they would probably face quite a bit of resistance from the White House right now in terms of timing and atmospherics," Dubowitz said. "But I think the White House appreciates that it's very useful to have Congress move the sanctions bills through the process at the same time as the U.S. is engaging Iran on the diplomatic side." Obama wants to give Rouhani a chance to prove that he's willing to curtail some of his country's uranium enrichment activity, which many believe is being used to give Iran nuclear weapons capability. At the very least, the administration wants to give Rouhani an opportunity to make concessions while Iran remains months away - if not longer - from achieving such capacity. The timing of the diplomatic effort itself is key, too, Anthony Cordesman at the Center for Strategic and International Studies think tank in Washington wrote in a paper Tuesday. "Those who oppose U.S. and Iranian negotiations need to realize that this is almost certainly the last chance for a real solution before Iran moves to the point of no return both politically and in terms of nuclear capability," Cordesman wrote. 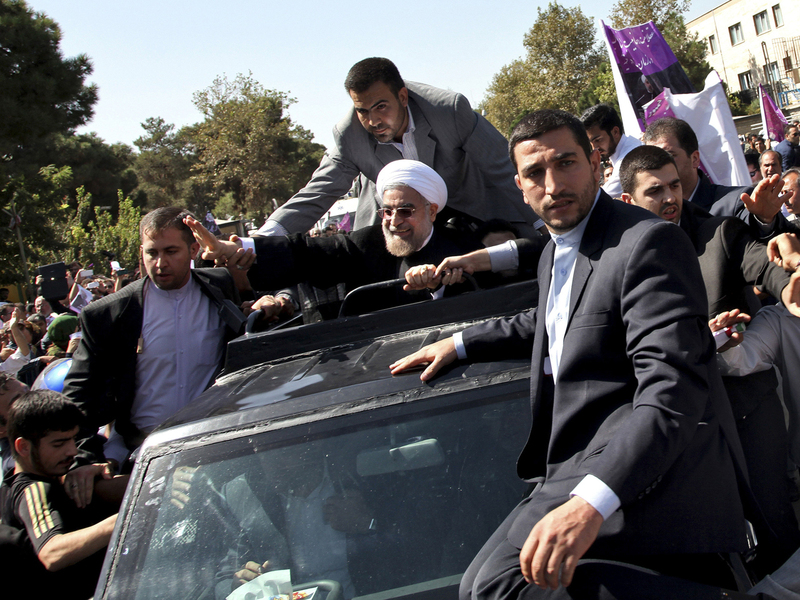 Israel, meantime, is warning the U.S. in its dealings with Rouhani. Israeli President Benjamin Netanyahu said in a speech at the United Nations on Tuesday that the new Iranian president was conducting a "charm offensive." Iran and Israel see each other as arch enemies. Tehran does not recognize the Jewish state, and supports anti-Israeli militants like Lebanon's Hezbollah and Palestinian Hamas.